"Shallow" was written by Lady Gaga, Mark Ronson, Anthony Rossomando, and Andrew Wyatt. The buzz for the latest iteration of A Star Is Born has been mounting for some time, and early reviews for the film have been overwhelmingly positive, with Rotten Tomatoes now showing a 95 percent critical rating based on 84 reviews. The film, which stars Lady Gaga and Bradley Cooper, who also served as the film’s director, is set to hit theaters October 5. Below you can hear the first single from the film’s soundtrack, “Shallow,” a tune that was written by Lady Gaga, Mark Ronson, Anthony Rossomando, and Andrew Wyatt. 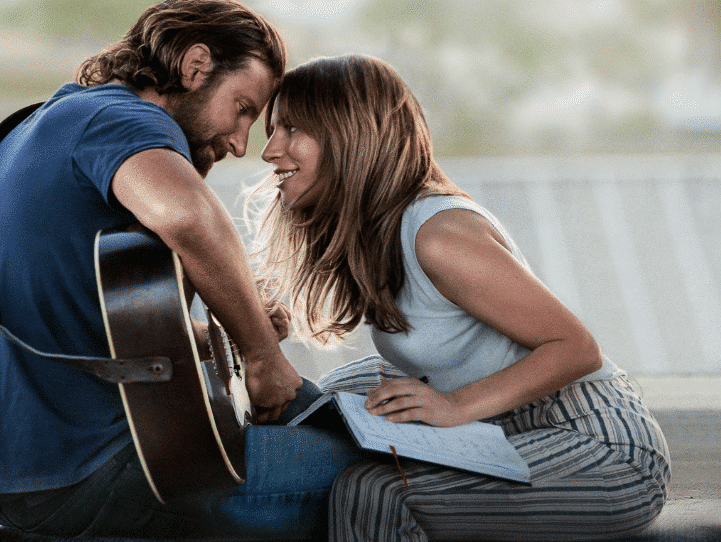 The soundtrack for A Star is Born features contributions from some sterling songwriters, including Jason Isbell (“Maybe It’s Time”), as well as Natalie Hemby, Hillary Lindsey, and Lori McKenna (“Always Remember Us This Way”). Lukas Nelson also co-wrote several tracks. See track listing for A Star Is Born after the video. 2. Black Eyes – Performed by Bradley Cooper. Written and produced by Bradley Cooper and Lukas Nelson. 5. La Vie En Rose – Performed by Lady Gaga. Written by Louiguy and Edith Piaf. Produced by Lady Gaga and Brian Newman. 7. Maybe It’s Time – Performed by Bradley Cooper. Written by Jason Isbell. Produced by Bradley Cooper and Benjamin Rice. 9. Out of Time – Performed by Bradley Cooper. Written and produced by Bradley Cooper and Lukas Nelson. 10. Alibi – Performed by Bradley Cooper. Written and produced by Lady Gaga, Bradley Cooper and Lukas Nelson. 12. Shallow – Performed by Lady Gaga and Bradley Cooper. Written by Lady Gaga, Mark Ronson, Anthony Rossomando, and Andrew Wyatt. Produced by Lady Gaga and Benjamin Rice. 14. Music To My Eyes – Performed by Lady Gaga and Bradley Cooper. Written by Lady Gaga and Lukas Nelson. Produced by Lukas Nelson. 15. Diggin’ My Grave – Performed by Lady Gaga and Bradley Cooper. Written by Paul Kennerley. Produced by Lady Gaga and Lukas Nelson. 17. Always Remember Us This Way – Performed by Lady Gaga. Written by Lady Gaga, Natalie Hemby, Hillary Lindsey, and Lori McKenna. Produced by Dave Cobb and Lady Gaga. 19. How Do You Hear It? 20. Look What I Found – Performed by Lady Gaga. Written by Lady Gaga, Mark Nilan Jr., Nick Monson, Paul “DJWS” Blair, Lukas Nelson, and Aaron Raitiere. Produced by Lady Gaga, Mark Nilan Jr., Nick Monson, and Paul “DJWS” Blair. 22. Heal Me – Performed by Lady Gaga. Written by Lady Gaga, Mark Nilan Jr., Nick Monson, Paul “DJWS” Blair, Julia Michaels, and Justin Tranter. Produced by Lady Gaga, Mark Nilan Jr., Nick Monson, and Paul “DJWS” Blair. 23. I Don’t Know What Love Is – Performed by Lady Gaga and Bradley Cooper. Written and produced by Lady Gaga and Lukas Nelson. 25. Is That Alright? – Performed by Lady Gaga. Written by Lady Gaga, Mark Nilan Jr., Nick Monson, Paul “DJWS” Blair, Lukas Nelson, and Aaron Raitiere. Produced by Lady gaga, Mark Nilan Jr., Nick Monson, and Paul “DJWS” Blair. 27. Why Did You Do That? – Performed by Lady Gaga. Written by Lady Gaga, Diane Warren, Mark Nilan Jr., Nick Monson, and Paul “DJWS” Blair. Produced by Lady Gaga, Mark Nilan Jr., Nick Monson, and Paul “DJWS” Blair. 28. Hair Body Face – Performed by Lady Gaga. Written and produced by Lady Gaga, Mark Nilan Jr., Nick Monson, and Paul “DJWS” Blair. 30. Before I Cry – Performed by Lady Gaga. Written and produced by Lady Gaga, Mark Nilan Jr., Nick Monson, and Paul “DJWS” Blair. 31. Too Far Gone – Performed by Bradley Cooper. Written and produced by Bradley Cooper and Lukas Nelson. 33. I’ll Never Love Again (Film Version) – Performed by Lady Gaga. Written by Lady Gaga, Natalie Hemby, Hillary Lindsey, and Aaron Ratiere. Produced by Lady Gaga and Benjamin Rice. 34. I’ll Never Love Again (Extended Version) – Performed by Lady Gaga. Written by Lady Gaga, Natalie Hemby, Hillary Lindsey, and Aaron Ratiere. Produced by Lady Gaga and Benjamin Rice.